Consultant physician in the Comprehensive Pain Program of the University Health Network in Toronto, Ont. Medical Director of the Comprehensive Pain Program and Professor in the Faculty of Medicine at the University of Toronto. Research analyst in the Comprehensive Pain Program. Research assistant in the Comprehensive Pain Program and is a doctoral candidate in the Institute of Medical Sciences at the University of Toronto. Objective To determine if medical marijuana provides pain relief for patients with chronic noncancer pain (CNCP) and to determine the therapeutic dose, adverse effects, and specific indications. Data sources In April 2014, MEDLINE and EMBASE searches were conducted using the terms chronic noncancer pain, smoked marijuana or cannabinoids, placebo and pain relief, or side effects or adverse events. Study selection An article was selected for inclusion if it evaluated the effect of smoked or vaporized cannabinoids (nonsynthetic) for CNCP; it was designed as a controlled study involving a comparison group, either concurrently or historically; and it was published in English in a peer-review journal. Outcome data on pain, function, dose, and adverse effects were collected, if available. All articles that were only available in abstract form were excluded. Synthesis A total of 6 randomized controlled trials (N = 226 patients) were included in this review; 5 of them assessed the use of medical marijuana in neuropathic pain as an adjunct to other concomitant analgesics including opioids and anticonvulsants. The 5 trials were considered to be of high quality; however, all of them had challenges with masking. Data could not be pooled owing to heterogeneity in delta-9-tetrahydrocannabinol potency by dried weight, differing frequency and duration of treatment, and variability in assessing outcomes. All experimental sessions in the studies were of short duration (maximum of 5 days) and reported statistically significant pain relief with nonserious side effects. Conclusion There is evidence for the use of low-dose medical marijuana in refractory neuropathic pain in conjunction with traditional analgesics. However, trials were limited by short duration, variability in dosing and strength of delta-9-tetrahydrocannabinol, and lack of functional outcomes. Although well tolerated in the short term, the long-term effects of psychoactive and neurocognitive effects of medical marijuana remain unknown. Generalizing the use of medical marijuana to all CNCP conditions does not appear to be supported by existing evidence. Clinicians should exercise caution when prescribing medical marijuana for patients, especially in those with nonneuropathic CNCP. Cannabis has had a long history of use for spiritual and religious purposes, as well as for various medical conditions.3 In 1999, an Institute of Medicine report4 supported the use of marijuana in medicine; however, the debate about the usefulness and safety of marijuana remains unresolved. The primary objective of this systematic review was to determine whether smoked or vaporized cannabis provides pain relief in the CNCP population. Secondary objectives included determining its effect on function, identifying therapeutic doses, and documenting commonly associated adverse effects. 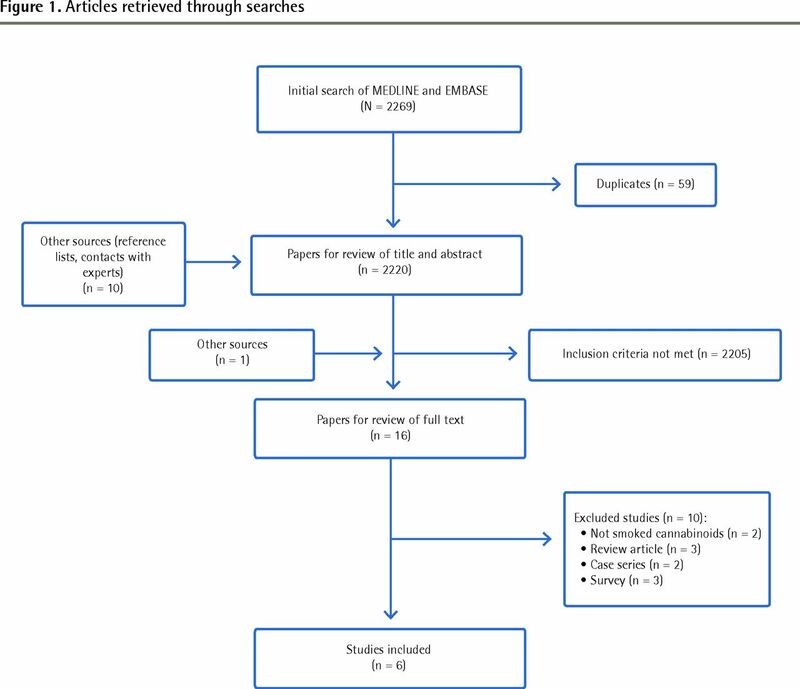 In April 2014, we identified eligible studies through an electronic search of MEDLINE, EMBASE, and the International Pharmaceutical Abstracts. The search strategy encompassed a theme that included the following terms: chronic noncancer pain, smoked marijuana or cannabinoids, placebo and pain relief, or side effects or adverse events. We selected an article for inclusion if it evaluated the effect of smoked or vaporized cannabinoids (nonsynthetic) for CNCP; it was designed as a controlled study involving a comparison group, either concurrently or historically; and it was published in English in a peer-reviewed journal. We excluded all articles that were only available in abstract form. To assess quality, we used the Jadad scale, a 5-item tool scored between 0 and 5.8 We categorized the trials as high or low quality with scores greater than 2 or 2 or lower, respectively. We found 2269 potentially eligible articles from the search strategy and 10 other potential articles through review of references. Sixteen relevant studies were subjected to full-text review (Figure 1) with one study9 identified later in the references of the College of Family Physicians of Canada guidance document on medical marijuana.10 Altogether, this review identified 6 randomized controlled trials,9,11–15 with 5 of them having crossover designs9,11–14; 1 study was performed primarily for spasticity in multiple sclerosis (MS) with pain evaluated as a secondary outcome.11 We did not identify any historically controlled comparative studies. In total, 226 adults (mean age of 45 to 50 years across trials) with chronic neuropathic pain were randomized, with 189 adults specifically identified as having chronic neuropathic pain.9,12–15 Two studies focused on HIV-associated neuropathy,13,15 1 on posttraumatic neuropathy,12 and 2 on mixed neuropathic conditions.9,14 The study involving patients with MS did not discriminate between spasticity pain and neuropathic pain.11 Three studies limited enrolment to patients with previous cannabis exposure,9,14,15 while 2 had no limitations.11,12 All trials excluded individuals with a history of psychotic disorders and previous history of cannabis abuse or dependence. All trials, except 1,15 reported the use of urine toxicology or other screening tools before starting the trial. Pain duration (6 to 9 years) was specifically mentioned in 3 trials,9,14,15 with 4 trials identifying baseline pain in the moderate range.9,12,14,15 Four9,12–14 of the 5 trials9,12–15 that allowed participants to continue to use opioids, anticonvulsants, and antidepressants reported that more than 50% of participants used concomitant opioids. Studies did not report the baseline dose of concurrent analgesics. The 2 trials open to cannabis-naïve participants reported dropouts or withdrawals owing to potential adverse effects of smoked cannabis11,12 such as psychosis (n= 1), persistent cough (n = 1), feeling “high” (n = 2), dizziness (n = 2), and fatigue (n = 1). Causes for the remaining dropouts in the 5 studies were unrelated to delta-9-THC consumption (eg, personal reasons, withdrawal of consent, medical causes unrelated to cannabis). A meta-analysis of the efficacy of using delta-9-THC could not be completed owing to the heterogeneity of interventions and outcome variables. While statistical reduction in pain was reported in all studies, a more fundamental outcome is clinically meaningful pain reduction (a decrease of 2 points on a 0-to-10 numerical pain rating or a 30% improvement in pain intensity), which has been associated with an improvement in a patient’s global impression of change.17,18 Only 3 of the 6 trials evaluated and reported positive findings in this respect. Functional assessment has also been designated as a core outcome domain in CNCP trials,17 but its measurement was absent in all included studies. With quality of life unchanged in 2 trials, the question of whether patients experience functional improvement with medical marijuana remains unanswered. Finally, there was a notable absence of effectiveness trials comparing outcomes with other known treatments in CNCP. Most studies, in fact, employed medical marijuana as an adjunct to participants’ existing opioids and adjuvant medications suggesting it might only have a role in refractory pain in conjunction with other analgesics. Finally, the amount of exposure to delta-9-THC in all studies was extremely low in contrast to that available in the marketplace. According to Health Canada’s website, the average amount of dried marijuana dispensed under the old MMAR was 1.0 to 3.0 g per day containing delta-9-THC concentrations of 12.5%.22 With an average dry weight of only 2.0 g per day, the available delta-9-THC exposure under the old MMAR program was 250 mg, or nearly 8-fold the maximum amount used in clinical trials. Now, under the newer regulations (Marihuana for Medical Purposes Regulation), industry producers can provide even higher delta-9-THC concentrations (up to 20% delta-9-THC by dried weight as shown on industry websites), suggesting a potential gap between evidence and product offerings. Previous systematic reviews have assessed the available evidence for the use of cannabinoids in chronic pain23,24; however, none commented systematically on the level of delta-9-THC consumption. The review by Martín-Sánchez and colleagues assessed the use of cannabinoids in chronic pain of any cause, with a third of the trials focused on cancer pain and interventions restricted to synthetic cannabinoids only.23 The authors commented on a positive, moderate, short-term trend toward pain reduction but noted serious adverse effects. The current evidence suggests that very low-dose medical marijuana (< 34 mg/d) is associated with an improvement in refractory neuropathic pain of moderate severity in adults using concurrent analgesics. There were no studies evaluating other CNCP causes including rheumatologic conditions.25 The generalizability of the results in CNCP is limited by factors such as the quality of studies, small sample sizes, very short duration, and dose and scheduling variability. Neurocognitive adverse effects such as learning, memory, and psychomotor deficits are common even with low-dose, short-term use but they appear well tolerated. However, the longer-term consequences of medical marijuana still remain unknown. These findings are consistent with existing guidance documents.10 Future trials should consider incorporation of standard outcome measures beyond pain, such as function and quality of life, similar to other interventions in CNCP.26 It might also be advantageous to enable prospective observational studies through creation of registries, protocols, and mandatory reporting of adverse events. Without additional evidence and a clear understanding as to the indications for and dosing of cannabis, there remains a risk that clinicians might unwittingly propagate similar issues that we now face with opioids in the management of CNCP. Medical marijuana has been proposed as a potential treatment for use in pain management. However, there is still uncertainty about the specific indications, ideal doses, and adverse effects that are related to this substance when used for medical purposes. While statistical reduction in pain was reported in all studies in this review, a more fundamental outcome is clinically meaningful pain reduction (a decrease of 2 points on a 0-to-10 numerical pain rating or a 30% improvement in pain intensity); only 3 of the 6 studies reported positive findings in this respect. Most of the studies employed medical marijuana as an adjunct to participants’ existing opioids and adjuvant medications, suggesting it might only have a role in refractory pain in conjunction with other analgesics. Neurocognitive adverse effects such as learning, memory, and psychomotor deficits are common even with low-dose, short-term use of medical marijuana but they appear well tolerated. However, the long-term consequences of medical marijuana remain unknown. On a proposé d’utiliser la marijuana médicale comme traitement potentiel de la douleur. Toutefois, on connaît encore mal les indications spécifiques, le dosage idéal et les effets indésirables de cette substance lorsqu’on l’utilise à des fins médicales. Même si toutes les études de cette revue rapportent une réduction significative de la douleur, une réduction cliniquement significative de la douleur (c.-à-d. une diminution de 2 points sur une échelle de la douleur entre 0 et 10 ou une amélioration de 30 % de l’intensité de la douleur) serait une issue plus fondamentale; seulement 3 des 6 études ont rapporté des résultats positifs de cette nature. Dans la plupart des études, on utilisait la marijuana médicale comme complément aux opiacées existants ou à des médications adjuvantes, ce qui suggère qu’elle pourrait n’être utile qu’en association avec d’autres analgésiques. Des effets indésirables d’ordre neurocognitif tels que des troubles d’apprentissage, de mémoire ou de psychomotricité sont fréquents, même avec des doses faibles et pour de courtes périodes, mais ces effets semblent bien tolérés. Toutefois, les conséquences à long terme de la marijuana médicale demeurent inconnues. All authors contributed to the concept and design of the study and data gathering. Ms Lakha, Dr Zoheiry, and Dr Deshpande contributed to the analysis of the study. Dr Deshpande and Dr Mailis-Gagnon contributed to the interpretation of the study and preparing the manuscript for submission.
. Treatment of chronic non-cancer pain. Lancet 2011;377(9784):2226-35.
. Opioids compared to placebo or other treatments for chronic low-back pain. Cochrane Database Syst Rev 2013;(8):CD004959.
. Medical use of cannabis: history and current status. Pain Res Manag 2001;6(2):80-91.
, editors. Marijuana and medicine. Assessing the science base. Washington, DC: National Academies Press; 1999. Medical use of marijuana. Ottawa, ON: Health Canada; 2015. Available from: www.hc-sc.gc.ca/dhp-mps/marihuana/index-eng.php. Accessed 2015 Jul 10. Collège des médecins du Québec. Guidelines concerning the prescription of dried cannabis for medical purposes. Montreal, QC: Collège des médecins du Québec; 2014. Available from: www.cmq.org/en/MedecinsMembres/DossierMembreFormulaires/~/media/Files/Cannabis/Guidelines-prescription-cannabis.pdf?111402. Accessed 2015 Jul 10. Adverse reaction information. Ottawa, ON: Health Canada; 2012. Available from: www.hc-sc.gc.ca/dhp-mps/medeff/advers-react-neg/index-eng.php. Accessed 2015 Jul 10.
. Assessing the quality of reports of randomized clinical trials: is blinding necessary? Control Clin Trials 1996;17(1):1-12.
. Low-dose vaporized cannabis significantly improves neuropathic pain. J Pain 2013;14(2):136-48. Epub 2012 Dec 11. Authorizing dried cannabis for chronic pain or anxiety. Preliminary guidance. Mississauga, ON: College of Family Physicians of Canada; 2014.
. Smoked cannabis for spasticity in multiple sclerosis: a randomized, placebo-controlled trial. CMAJ 2012;184(10):1143-50. Epub 2012 May 14.
. Smoked cannabis for chronic neuropathic pain: a randomized controlled trial. CMAJ 2010;182(14):E694-701. Epub 2010 Aug 30.
. Smoked medicinal cannabis for neuropathic pain in HIV: a randomized, crossover clinical trial. Neuropsychopharmacology 2009;34(3):672-80. Epub 2008 Aug 6.
. A randomized, placebo-controlled, crossover trial of cannabis cigarettes in neuropathic pain. J Pain 2008;9(6):506-21. Epub 2008 Apr 10.
. Cannabis in painful HIV-associated sensory neuropathy: a randomized placebo-controlled trial. Neurology 2007;68(7):515-21.
. Empirical evidence of bias. Dimensions of methodological quality associated with estimates of treatment effects in controlled trials. JAMA 1995;273(5):408-12.
. Interpreting the clinical importance of treatment outcomes in chronic pain clinical trials: IMMPACT recommendations. J Pain 2008;9(2):105-21. Epub 2007 Dec 11.
. Clinical importance of changes in chronic pain intensity measured on an 11-point numerical pain rating scale. Pain 2001;94(2):149-58.
. Non-analgesic effects of opioids: the cognitive effects of opioids in chronic pain of malignant and non-malignant origin. An update. Curr Pharm Des 2012;18(37):6116-22.
. Adverse health effects of marijuana use. N Engl J Med 2014;370(23):2219-27.
. Prevalence of opioid adverse events in chronic non-malignant pain: systematic review of randomised trials of oral opioids. Arthritis Res Ther 2005;7(5):R1046-51. Epub 2005 Jun 28. Daily amount and dosing information sheet. Cannabis (marijuana, marihuana). Ottawa, ON: Health Canada; 2014. Available from: www.hc-sc.gc.ca/dhp-mps/alt_formats/pdf/marihuana/med/daily-quotidienne-eng.pdf. Accessed 2015 Jul 10.
. The dilemma of medical marijuana use by rheumatology patients. Arthritis Care Res (Hoboken) 2014;66(6):797-801.
. Evaluating common outcomes for measuring treatment success for chronic low back pain. Spine (Phila Pa 1976) 2011;36(Suppl 21):S54-68.